In addition to the feature article below reprinted from the Santa Rosa Press Democrat, stories are included throughout the site. 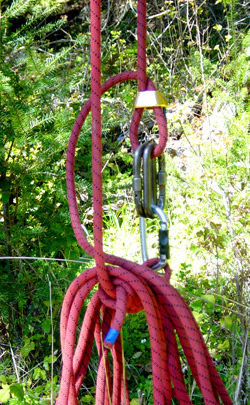 Please visit each page to read about various group outings and activities during a Four Winds Ropes Course. Santa Rosa's gang wars didn't end on Thursday, but hostilities were suspended temporarily when the two sides met on a wooded west county hillside. There, for a few hours on a soft autumn day, violence took a break. Sure, a group of surenos "leaned on" a member of the rival norteno gang, but they did it out of need instead of aggression. Several tough-looking guys "held up" a skinny kid, but they were supporting him instead of robbing him. At least a few of these noncombatants are among Santa Rosa's 2,000 identified gang members. Several others are on track to swell that number. And all are teen-agers who, because crime or truancy got them kicked out of other schools, attend the Santa Rosa Community School, where the staff includes a probation officer and a drug counselor. Most days, they avoid each other. Some days, they fight each other. On Thursday, they needed each other. Once a semester or so, the kids from the Community School get a chance to go fishing or skiing or whitewater rafting. The trips, courtesy of Social Advocates for Youth, are a chance to get them out of their comfort zones and into places that challenge them to see each other in a different light, to use skills they might not know they possess. 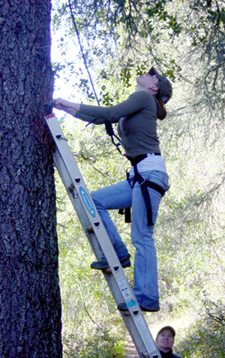 On Thursday, they visited the Four Winds ropes course at the Ocean Song Farm and Wilderness Center west of Occidental. It didn't start well. As an instructor outlined the rules, the group of 15- to 18-year-old boys split into two camps: light sweatshirts and dark sweatshirts. Teacher Dyan Kelly said it was coincidence that they dressed that way, but not that they divided themselves that way. Except for a couple of undecided kids, the "lights" and "darks" identify with different gangs. Thursday, though, they all needed to be a "team." That's the idea of a ropes course. 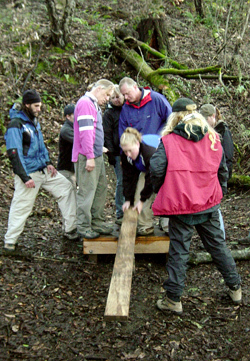 It involves a series of exercises specifically designed to enhance team building, cooperation, problem-solving. The boys' first task was to "cross the Amazon" on a series of cables strung two feet above the ground. To succeed, they needed to help each other, hold hands, work things out. They attacked the problem their way. "Lights" went first. Then the in-betweeners. And finally, "darks." At the end was Luis (I've changed the kids' names), the biggest, angriest-looking one of the bunch. He didn't want help. He fell. Following the rules, Luis went back to the beginning. And there he found Willie (a "light"), who also had gone into the drink. They looked at each other—barely. The group on "the other side of the river" cheered them on. Finally, Willie climbed up on the cable, offered his hand, and he and Luis inched their way across. That's how it went. The group moved from the Amazon to the tar pit, the sinking ship, and so on. At each stop they had to help each other, work with each other, even touch and hold each other. They got used to it. After about an hour, even Luis was cracking an occasional smile. Joe Giglio, a county probation officer who supervises several of these kids, said they were treating each other a lot differently than they do around school or on the street. "I guess maybe fun is getting in the way of the normal stuff," he said. It's easy to forget: Before they are gang-bangers, they are kids. A lot of them still are kids. Given the chance (like when nobody's looking) they even enjoy acting like kids. Miguel, one of the "lights," said he'd never imagined having so much fun with the boys from the other group. "It makes you think about, `Why can't we always be together like this?'" Santa Rosa's gang wars didn't end on Thursday. But Willie reached out his hand to Luis. And Luis, given the choice of touching his enemy or letting down his team, reached back.